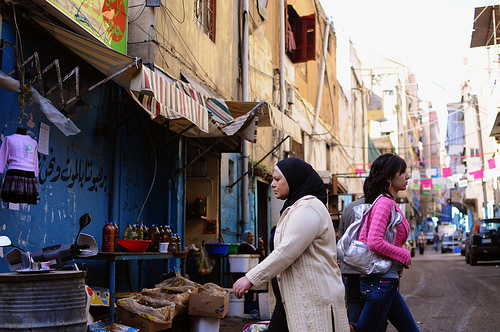 The Palestinian refugee camps of Sabra and Shatila are only a few kilometres from the polish of downtown Beirut, but they might as well be in a different country. To walk down the frenetic main street is a physically disorientating experience. Everywhere you look there is filth and rubbish. Blood from the butcher’s courses across the grubby pavements; stray goats nibble at black bin bags heaped in 6ft piles by the road; muddy paths leading to crumbling hovels wind off deep into the camp, and scooter after scooter screeches down the road through a teeming bustle of the downbeat and dejected. It was here in September 1982 that a Christian militia allied to the Israeli army carried out a two-day massacre and slaughtered anywhere between 800 to 3,500 defenceless Palestinian refugees. At the height of the Lebanese civil war, after Israel had invaded Lebanon in a bid to stamp out the Palestinian Liberation Organisation and establish a Christian vassal state north of their border, Phalangist militiamen went on the rampage through the camps despite the full knowledge of some of the Israeli high command about what was taking place. 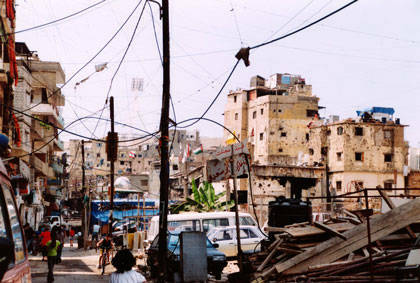 The names of Sabra and Shatila have lived in infamy ever since. The camps themselves sprung up as a result of the 1948 Arab-Israeli War, but have now become a permanent feature of the Lebanese capital featuring all the things you might see in any other Arab town. The market selling plump tomatoes and courgettes sits under the shadow of a large mosque with a towering minaret, while lines of hungry men jostle at the shwarma stall and others have their beards trimmed at the nearby barber. But walking through the camp it is impossible to keep track of the number of men who have fallen victim to the impenetrable Shatila Stare – that lost-for-good look which speaks of a wretched inner hopelessness. Amid all the filth and the car fumes, a group of children play happily on a rusty, miniature roundabout on the side of camp’s main street. Grinning and squawking, for them it is the only way to play they have ever known. Another, very pretty girl of maybe eight or nine years of age stands by a rack of cauliflowers in the market. As a child in the West she would have a wealth of opportunities in a life away from the garbage-filled gutter. In Lebanon she has become a prisoner.